The 2011 European Women Basketball Championship, commonly called EuroBasket Women 2011, is held for the 33rd time. FIBA Europe have been responsible for the European zone since 1992 and are once again the governing body organising the event. The Preliminary Round, also known as the first round, sees all sixteen teams participate from 18 June until 20 June 2011. The teams are divided into four groups of four teams. The top three teams from each group qualify for the Qualifying Round while the bottom teams from each group are eliminated. The Qualifying Round will take place between 22 and 27 June 2011. There are two groups composed of six teams. The top four teams from the two groups then qualify for the Final Round, also known as the final 8 or quarter-final, while the remaining teams are eliminated. The Final Round is basically a knock-out competition with the brackets determining the finishing order in each group. 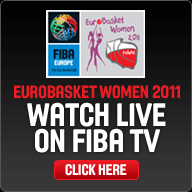 This phase of EuroBasket Women 2011 will take place between 29 June and 3 July 2011. This page is updated regularly during the competition and appear regularly in our RSS Feed to help you keep track. In order to subscribe to our RSS Feed please read: What is a RSS Feed? All the links for this edition will appear on the right-hand side of this page. All the games will be broadcast live and with our our partnership with FIBA TV you will be able to view all the matches live or on demand after taking out a subscription package with their TVONLINE service. Please be aware due to television rights in Japan, France and Russia it will not be possible to view this event at all during the competition. For our readers in the USA, all games are delayed by 48 hours before coming available while it is not possible to access FIBA TV in Central and South America.